Earlier I discussed that Wonder Woman Vol. 9: Resurrection, the final volume by Meredith Finch, would contain the Wonder Woman: Rebirth special by Greg Rucka. You all had a variety of opinions -- for, against, and indifferent. DC Comics's September 2016 hardcover and trade paperback solicitations bring with them collections of the final issues of the pre-Rebirth Aquaman, Cyborg, and Red Hood collections, and sure enough, those have got the respective series' Rebirth specials collected in them, too. What concerns me most here is that I just cannot believe the first new collections of these Rebirth series won't also collect the Rebirth specials (and also be renumbered again). Which is to say, there's some guaranteed double-dipping for those of us who follow from the old collections to the new, and that's shaky ground to start off on. I get it from DC's perspective, it's all about avoiding jump-off points and inviting readers to keep reading; it's just a bummer for the trade waiters. Also, this will be inconsistent, as we see below -- some final trades before Rebirth will have the specials, some won't. I believe there was some question as to whether this omnibus would collect all the DC Rebirth specials and all the #1 issues, or just the specials; the answer now seems to be "just the specials" at $75, though discounted in many places to $50. Unlike, for instance, the Futures End: Five Years Later Omnibus, where the stories were considerably disconnected, I imagine this might have a slightly better read-through experience, at least in terms of the Rebirth special proper to Flash to Titans, and also how DC Universe: Rebirth precedes Superman, Blue Beetle, and etc. Collects Aquaman #48-52 and the Rebirth special. This collects, as far as the solicitations, Cullen Bunn's last issue, #48, and then four by Dan Abnett plus the Rebirth special by Abnett. So while I'm not crazy about the Rebirth special being there, at least there's some continuity to the creative team. Here, on the other hand, we've got a collection of issues #7-12, by David Walker and Marv Wolfman, and then the special by John Semper. At least this one too keeps its writer, but again, I think it's a bad precedent to include the Rebirth special. Notable is that all three of these had been cancelled but are now resolicited, which I guess is a "never say never" argument (but I still don't see the Starman Omnibus Vol. 3 paperback back on the schedule). The Lobo book finishes out Cullen Bunn's Lobo series; the Supergirl book (cancelled more than once?) 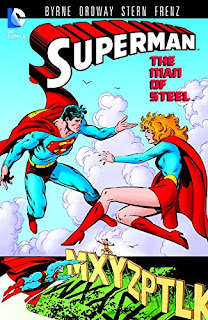 is early Peter David/Gary Frank material; and the Superman book is the end of John Byrne's run with the "Supergirl Saga" and the Phantom Zone villains. The final collections of these series, none of which include the Rebirth specials where appropriate, demonstrating that not all the ending books, at least according to the solicitations, will have their Rebirth specials. This is both is heartening but equally also a little frustrating. The Grayson book includes Robin War #1-2; it's nice that these aren't only collected in the Robin War book (a la Superman: Doomed). The Midnighter collection also includes issues #7-8 of the Wildstorm Midnighter series, by Brian Vaughan and Christos Gage respectively. Collects just the Infinite Crisis miniseries (as opposed to the Infinite Crisis Omnibus) plus script and art extras. I like DC going through and collecting all their Elseworlds material, but I have to cry foul on Elseworlds: Batman Vol. 2. If there's any other Batman Elseworlds that need collecting, then collecting Doug Moench and Kelley Jones's Vampire Batman Red Rain trilogy -- other copies of which I believe are still in print -- seems wasteful, with no offense intended to the creative team. If you already owned that, bought Elseworlds: Batman Vol. 1, and might want Elseworlds: Batman Vol. 3, then that leaves you either with a hole in your collection or significantly double-dipping. I'd have put these in the last Elseworlds: Batman volume, if at all. Whereas the original Hunt for Oracle collection included Chuck Dixon's Nightwing #41-46 and Birds of Prey #20-21, this new edition is said to include Nightwing #35-46 and Birds of Prey #21. The first two new Nightwing collections kept pace with the originals, just with additional miniseries and other extras; with Vol. 3, the book collected a little short of the original (albeit with extras); the fourth volume straddled a collection; and with this volume, the Nightwing collections now match back up again (for the moment). My guess is that Birds of Prey #20 is also included here and the solicitation is just a misprint. Collects the six-issue Len Wein/Kelley Jones miniseries. Anyone know if this follows off the continuity of the Charles Soule run or if Wein starts from scratch? So where do you want your Rebirth specials collected? What else is on your list? Haven't been keeping up with Swamp Thing since Snyder left, but I couldn't resist a Kelley Jones ST mini. Seemed fairly disconnected from most of the Swamp Thing stuff I've read, with some emphasis on bringing him in contact with Dark universe characters (Phantom Stranger, Zatanna, et al). Touches on some of the Moore-era ST, with Matthew Cable turning up. If anything, it seems loosely connected to the Convergence two-parter by Wein/Jones (which I hope is also collected here). Speaking of, do you know if the Lois & Clark trade will have the Convergence issues? Those seem even more pressingly connected to the series proper. Which is kind of maddening, but at the same time, the Wein/Jones Convergence book was among the best of the bunch, so that's a point in the miniseries' favor. As far as early solicits, neither the Swamp Thing nor the Lois & Clark books seem to have the Convergence issues in them. I see why that would be attractive but then again all those Convergence issues have already been collected; there's just as good an argument for completeness as there is for not having to double-dip. Attractive? I daresay essential, in the case of Lois & Clark! Jon Kent's birth is the central event in Convergence: Superman, and considering he seems to be a major figure in the Rebirth landscape I can't believe they'd omit him. I mean, I *could* believe it, but I'd rather not. Maybe I don't follow what you mean. If Jon is born in Convergence: Superman, collected in the very available Convergence: Flashpoint Book One TP, I don't think DC necessarily must also collect Convergence: Superman in the Superman: Lois & Clark collection. It might be nice (it might make the Superman: Lois & Clark collection more "attractive"), but it's not entirely different from Event A happens in this collection and it's reflected in this other collection later. Are we completely sure that the new Rebirth trades will be renumbered back to #1? I'm a bit skeptical now. I don't know for sure, but I'd be shocked if they were not renumbered. It has been DC's policy all along to renumber trades after any major break, and especially if they're trying to entice people to "jump on," Wonder Woman Vol. 10 isn't the way to do that. Not to mention walling off Scott Snyder's Batman run, creating a jump-on point for Suicide Squad, etc., etc. Certainly I'd rather all new Vol. 1s than some re-numbering, some not. I agree, I would greatly prefer new Vol. 1s for all of the books. And I'm inclined to agree with you regarding DC's policy, but DC's decision to included some Rebirth issues with some books (but not all?) threw me for a loop. Is that simply for padding purposes? I seriously hope that they include the Rebirth issues in the new trades as well, as that seems to be what literally everyone wants. I did annoyed me the content of the batman elseworlds 2. Last year I bought the tales from the multiverse trade so now I will skip vol 2 and go straight to vol 3. Is very poor planning from DC. I just hope the next superman elseworlds doesn’t include red son in their next trade. With the Nightwing trades I always doubt if I should double dip, there are a couple of issues the original trades didn’t include but at the same time I already have the original hunt for oracle trade. Also, will the Birds of Prey trades will include the Nightwing issues? It is starting to get really confusing what to buy and what not buy. It's hard to say if the new Chuck Dixon Birds of Prey collections will have the Nightwing issues in them; that's logical, but then again if DC collects BOP in Nightwing, they might not do the other way around. Basically if you have the old trades, then you're just investing in the new ones for a handful of issues here and there, at least until both the Nightwing and Birds of Prey trades get into previously uncollected issues. One of these days, Aquaman by Peter David is going to show up on these solicitations, and I'm going to be thrilled. I'd think movie-time is going to be your best bet on that. Actually that's probably not the final collection for Grayson, which likely will be vol. 5 to include the remaining issues from the monthly and the third Annual. Starman Omnibus paperback 3 seems to be in the sameimbo as the other Titans Hunt trade, amazon listing still there just no available for purchase. As I own the HBs for the 1st, just my random way to mention the latter. Funnily Starman Onibus 4 paperback is actually available for pre-order on Amazon with a a tentative dec, 2016 release date. It's really weird that they would stretch out Grayson over 5 whole volumes. By my count, there are 20 issues, 3 Annuals, and 1 Futures End special. I suppose the Robin War issues add a bit more context and more padding. There should be four more issues and an Annual, and possibly the Rebirth issue left. Couple of "short" trades finishing out this era - Grayson would be four issues and an annual, Aquaman should be four-five issues and the "Rebirth" special, etc. Not totally surprising around a relaunch. I just saw in Amazon the solicitation for Batman: Knightfall Omnibus vol 1! What do you think it'll include? Maybe this time we'll have a more complete collection of that saga? I'm very curious to see the content listing for this omnibus, but the fact that it's a "volume 1" gives me hope that this time they'll do a more comprehensive job of collecting the storyline now that they don't have to make it fit three 640-page TPBs. I'd bet good money that they won't skip "The Search" this time around, but I'd also like to see the "Zero Hour" tie-ins included, as well as the short "Troika" crossover that followed "Prodigal", in order to give these collections a more conclusive ending. And depending on the total amount of pages, it could be an opportunity to include some prelude stuff like the Sword of Azrael mini and the issues of Batman and Detective Comics where Batman gets progressively worn down by Bane's schemes. That is the best-case scenario, that this is finally the Knightfall collection(s) to rule them all, including Sword of Azrael, all the prologue stuff, through to The Search, Justice League Task Force, and everything all the way through Troika. It's definitely time. Well, it actually says "and more", but I'm not optimistic. It's an obviously wrong content listing, since there's no way almost 80 issues would fit in a single omnibus volume. It's also missing some stuff that's in the 2012 TPBs, like Batman: Shadow of the Bat #16 and Catwoman #12-13, not to mention it wouldn't make sense to include the SotB portion of "The Search" without the remaining chapters that ran in Justice League Task Force and Batman: Legends of the Dark Knight. However, it does seem to indicate they have no plans to include the preludes, nor "Troika". Still, we won't know for sure until the presumably accurate solicitation copy shows up. We've seen omnibuses of 52+ issues with the Zero Month Omnibus, etc. What's the upward limit of an omnibus, do you think? 80 is too many? The thickest omnibus DC has released so far is the Invisibles Omnibus, which clocked at 1536 pages, enough for 59 issues plus a couple of short stories and lots of extras. I take that to be the upward limit, unless DC is looking into breaking records. *Deadpool: Beginnings Omnibus HC--If I'm reading the solicit correctly, this is mostly Deadpool Classic Vol. 1 and 2 plus a whole bunch of other early appearances from X-Force, Secret Defenders and more. It's good for completionists who don't have the trades. *Amazing Spider-Man: Worldwide Vol. 1 HC--I haven't even gotten to Spider-Verse yet, and that was the previous volume! I don't mind a lot of the renumberings but Spider-Man has gotten out of control. *Deadpool: World's Greatest Vol. 1 HC--Collecting the first two trades of the current series. It's going to get a little complicated once the Deadpool 2099 story is finished... two years from now. *Marvel Masterworks Invincible Iron Man Vol 10 HC: "The world's most famous Avenger is about to face one of his greatest challenges"... having a nose on his armor! It's the classic George Tuska Nose Armor era which is pretty underrepresented in trade format. *Dr. Strange: A Separate Reality Epic TPB--Unsurprisingly, fall is trade season for Dr. Strange in preparation for the movie, and this puts a lot of the great Roy Thomas and Steve Englehart material in one convenient place. Plus: Shuma-Gorath! *Dr. Strange: The Flight of Bones TPB--I didn't even know that there was a Marvel Knights Dr. Strange title, and this sounds like a neat anthology trade with a lot of good creators involved. *Captain America Sam Wilson Vol. 2: Standoff TPB--This can also be called "Avengers: Standoff Abridged" since it contains the issues necessary for the plot framework of the crossover. I'd recommend getting the whole story because it's fantastic, but the cheaper option is a bonus. *ANAD Avengers Vol. 2: Family Business TPB--The identity of the new Wasp is shocking... as in I was actually shocked when it wasn't Hope Pym from the movies. The Standoff tie-ins are the weaker part of the book and don't work as well without Uncanny Avengers bolstering them. *Daredevil/Punisher: Seventh Circle TPB--Bridging the gap until Becky Cloonan's Punisher title started, Charles Soule wrote this neat little mini to coincide with the Netflix show's second season. Soule is one of Marvel's best writers and his Daredevil is back to the top of my to-be-reviewed list after Deadpool #13. *Vote Loki TPB--Hey, remember DC Universe: Decisions, the edgy political series that pissed everyone off in equal amounts that they didn't even collect it? Vote Loki is a much better written political satire comic which flows perfectly from Ewing's "Loki, Agent of Asgard", although the art is pretty bad. *Black Panther: Panther's Rage Epic TPB--Holy cow, the Don McGregor BP stories are getting collected in softcover! The only way to get this before was in a Masterworks edition six years ago. "Panther's Rage" has been cited as one of the first modern multi-issue storylines and seems to be an influence on Ta-Nehisi Coates' run. *Son of Satan Classic TPB--You mean they're doing a trade about Daimon Hellstrom and they're not collecting the incredibly creepy 90s series? I hope that's on the docket soon. *Aleister and Adolf HC--Considering how much Crowley's mysticism owes to Kabbalah, this was probably inevitable. It'll look great since Michael Avon Oeming is drawing it but it would be such a mindscrew if this turned out to be the sequel to Osamu Tezuka's "Message to Adolf". *Ranx HC--Ultraviolence? 80s political satire? A dude made out of photocopier parts whose name is short for RanXerox? You have my attention. *Transformers MTMTE Vol. 10--The final trade (WHAT?!) before the series restarts and renumbers (phew!) with the same creative team. "The Dying of the Light" has one more issue to go as I type this and James Roberts' momentum shows no signs of stopping. *Elephantmen Mammoth Vol. 2 TPB--I wish there was more news on the potential movie adaptation of Elephantmen, but at least I can keep up with the story in order. Night of the Monster Men starts in Batman #7, so I suppose the first post Rebirth collections will begin to drop in January, at the latest. Great find! I wonder how long it'll be until Amazon starts putting up some Rebirth trades. I just want to know whether they're renumbering their trades back to volume one. "Notable is that all three of these had been cancelled but are now resolicited, which I guess is a "never say never" argument (but I still don't see the Starman Omnibus Vol. 3 paperback back on the schedule)." All three of these were cancelled to be resolicited, while Starman was cancelled period. Nightwing: Hunt for Oracle should have Birds of Prey #20 and even the page count agrees. And yes, I fully expect Nightwing #45-46 to be included in Birds of Prey volume. Why wouldn't they be? 'Cause things happen funny and if it was just collected in one, maybe not in the other. But I hope it will be, too. Add the "Dark Joker—The Wild" graphic novel (and maybe the "Unseen" miniseries) to the Batman Elseworlds collection and I'll be happy to double dip. I'm not paying for a re-skin of a book I already own. "Dark Joker-The Wild" is collected in the Batman Elseworlds book 1. I agree with "Unseen" being added, as well as "Haunted Gotham" from the team of Doug Moench and Kelley Jones. If it matters to the conversation at all, there's a listing now for Elseworlds: Batman Vol. 3, which is said to contain at least Brotherhood of the Bat (set in the future, using alternate Batman costumes), Scar of the Bat (1920s gangsters), Dark Knight Dynasty (past and future), and Man-Bat. Also, that vol. 3 originally showed up as vol. 2, then the Moench/Jones book appeared as Elseworlds: Batman Vampire, and then it got changed into vol. 2 and the former vol. 2 into vol. 3 as it is now. Thanks for the warning on Elseworld Vol. 2- I cancelled my pre-order. With the upcoming Suicide Squad movie, I am surprised we never got an Absolute Batman: Mad Love. You could add the "Harley & Ivy" specials by Bruce Timm/Paul Dini to the collection and get a pretty decent absolute edition (the obvious focus being on Harley Quinn books by her original creators).